Adaxes Web Interface can be customized to provide access to the most frequently used features directly from the Home page. 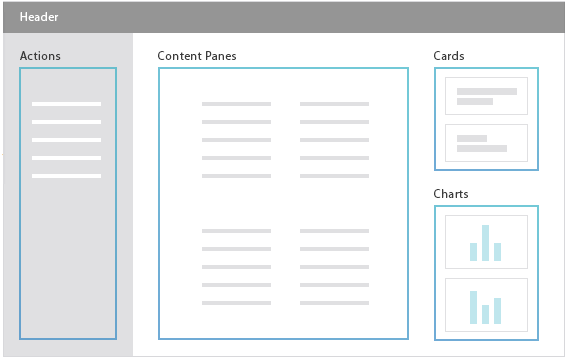 The Home page is divided into the following major sections: Header, Actions Pane, Content Panes, Cards and Charts. If necessary, you can disable the Home page. For details, see Disable Web Interface Components. The Home page header can contain either navigation elements or user account information with the Edit button. User information in the header can be useful for self-service, as it gives users quick access to their own account. In the left navigation menu, click Home Page. Configure header settings in the Header section. For instructions on how to change the logo and the color of the Edit button, see Set Custom Logo and Colors. The Actions pane allows users to perform frequently used operations right from the Home page. The pane can contain operations on Active Directory objects, Custom Commands, and links to external web sites. 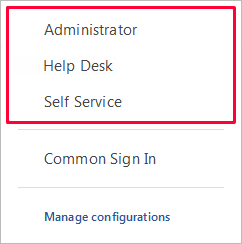 For instructions on how to configure the Actions pane, see Configure Actions Pane. The middle part of the Home page can contain Active Directory objects to which users need quick access. The objects are grouped into lists that are displayed in separate panes. Each pane can contain specific Active Directory objects, members of groups and Business Units, objects located in specific Organizational Units, reports, etc. To add, edit, delete and move panes, use the buttons located in the Contents section. To hide a pane, uncheck it in the list. In Adaxes Web Interface, users can see only the Active Directory objects they have permissions to view. If you added an object on the Home page, and a user doesn't have the right to view it, the object will not be displayed to the user. For details, see Hide Active Directory Objects from Users. You can configure the Home page to display different objects depending on who is logged in. 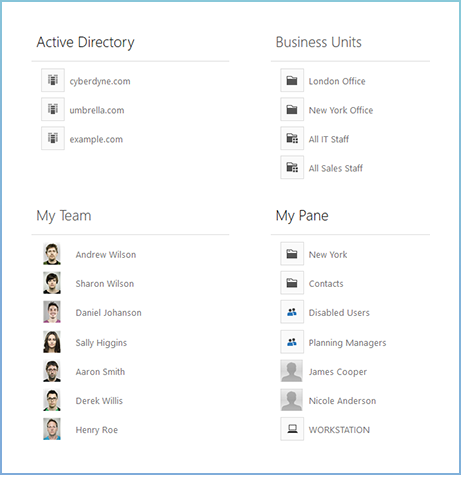 For example, the page can display the manager of the logged in user, objects located in the user's Organizational Unit, members of the group associated with the user's department, etc. 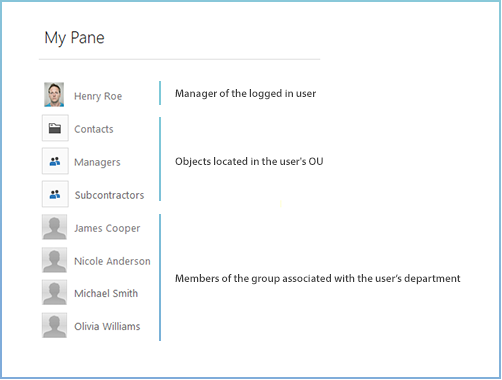 If you want a pane to contain different objects based on the logged in user, you need to use templates. A template is used to build the Distinguished Name (DN) of an Active Directory object. To include properties of the logged in user in a template, use value references. Value references will be replaced with corresponding properties of the user. For example, value reference %department% will be replaced with the value of the Department property of the user. In the Contents section, select the pane to which you want to add an object and click Edit. In the dialog that opens, activate the Contents tab and click Add. In the Add dialog, select whether you want to add a single object, members of a group, or objects located in an Organizational Unit. Then click the button embedded in the Select Object field. In the Template field, specify a template for the distinguished name (DN) of an Active Directory object. To insert a value reference, click the button. Manager of the logged in user. The Organizational Unit where the account of the logged in user is located. The Active Directory domain of the logged in user. The %department% value reference will be replaced with the name of the department of the logged in user. The pane will contain an object that has the same name as the user's department and located in the Users container in domain example.com. The %adm-DomainDN% value reference will be replaced with the Distinguished Name of the AD domain of the logged in user. The pane will contain an Organizational Unit named Contacts located in the user's domain. If a pane contains a report, parameters for report generation can also be different depending on the logged in user. For example, you may want to set a report parameter to the value of the Department property of the user's account. Or, you can limit the report scope to the Organizational Unit where the user's account is located. Cards allow users to see useful information and initiate some self-service actions right from the Home page. There are three types of cards: Change Password, Password Self-Service and My Account. The card shows how many days left until the password of the logged in user expires, and when the password was last changed. It also contains a button that allows users to change their password. You can configure the card to highlight the button when, for example, the password expires in less than 3 days. The card enables users to enroll, re-enroll and cancel enrollment for Password Self-Service. The card is not visible when there are no policies for Password Self-Service assigned to the logged in user. 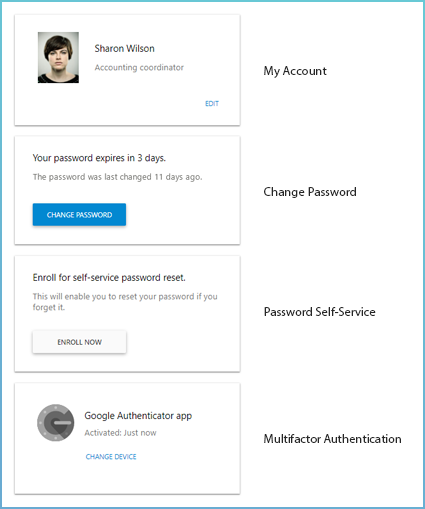 The card displays brief information about the account of the logged in user and gives them quick access to view and edit their account. Configure settings in the Cards section. 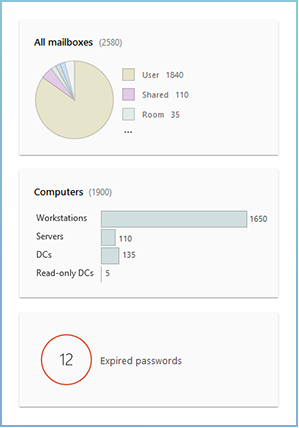 Charts on the Home page provide visual overview of essential information related to Active Directory, allow monitoring security-sensitive changes to AD objects, account and password statuses, risk analysis, etc. To add, edit, delete and move charts, use the buttons located in the Charts section. To hide a chart, uncheck it in the list. The charts are created based on data collected by generating reports. Parameters for report generation can be different depending on the logged in user. For example, if you want a chart to contain data for the department of the logged in user, you can set	a report parameter to the value of the Department property of the user's account. 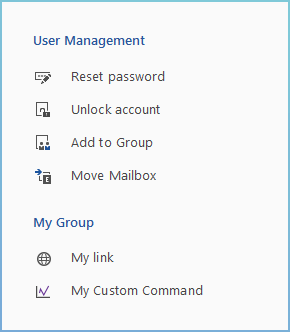 Or, you can limit the report scope to the Organizational Unit where the user's account is located. To include properties of the logged in user to report parameters and scope, you need to use value references. Value references are replaced with corresponding properties of the user's account. For example, value reference %department% will be replaced with the value of the Department property of the user. To increase performance, the data for charts is cached. The cache is updated approximately once a day. To force the charts to refresh, click the button located at the top right corner of the page.